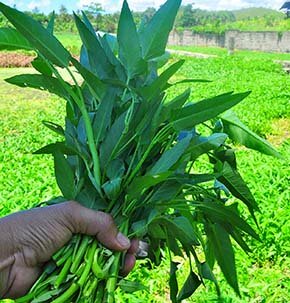 Kangkong or water spinach is one of the very familiar green leafy vegetables used in the South and South-East Asian cuisine. Its gently sweet, mucilaginous, succulent leaves and stems are very much sought-after in the salads, braised and stir-fries. Botanically this fast-growing leafy vegetable belongs to the Convolvulaceae family, and closely related to the sweet potatoes but has no resemblance to spinach. Scientific name: Ipomoea aquatica Forsk. The water spinach plant features smooth, hollow stems similar to watercress, and therefore, is called as hollow stemmed vegetable (Kung Shin Tsai) in China. Its green, arrowhead (lanceolate) shaped leaves widely vary in size from 2.5 to 8 cm in breadth. White, trumpet-shaped flowers with purple center appear later in the stages but are not produced in the actively harvesting plant. Based on the growth habit, there are two varieties of water spinach. The tall, erect type which grows on the soil that is rich in organic matter and sufficient moisture. New roots emerge at inter-nodal junctions which when come in contact with the soil, fix and grow further like a creeper. The other type is semi-aquatic, grows in swamp ground, called swamp cabbage. Its primary root is fixed in the soil and secondary (adventitious) rootlets at the inter-nodes are either free floating in the water, or when come in contact with the surface, cling on to the soil. Kangkong greens are very low in calories and fats. Nonetheless, its succulent leaves carry plenty of vitamins, lead in the front by vitamin-A (6600 IU/100 grams), in addition to being rich in antioxidants and minerals. 100 grams of fresh leaves carry just 19 calories. For the same reason, it is one of the exquisite greens often recommended by the dieticians in the cholesterol controlling and weight reduction programs for their overall antioxidant, low-calorific and low-fat properties. Fresh water spinach leaves carry abundant levels of phenolic antioxidants such as carotene-β, lutein, xanthin, and cryptoxanthin. Raw, fresh kangkung leaves carry excellent levels of ascorbic acid. 100 g of greens provide 55 mg or 92% daily equired values of vitamin-C. Vitamin-C is a powerful water-soluble antioxidant which helps as free-oxygen radicals and reactive oxygen species (ROS) scavenger, and thus protect the human body from various disease processes. Further, regular consumption of foods rich in vitamin-C could help in the connective tissue, hair, skin repair; and also contribute in the prevention of iron deficiency anemia, and delay in aging, and cancers. Water spinach greens are one of the most abundant sources of vitamin-A,; similar to that of other common greens like spinach, kale, watercress, etc. 100 grams of fresh greens compose of 6300 IU or 210% of daily recommended values of this vitamin. Vitamin-A is essential for mucosal integrity, health of skin, hair and vision. It also works as anti-cancer, anti-aging factor at cellular level in the humans. They are also rich in the several B-complex group of vitamins such as riboflavin (8%), niacin (5.5%), vitamin B-6 (pyridoxine-7%), folic acid (14%), etc, that play a vital role in the metabolic functions. Additionally, the greens also compose minerals such as iron (21%), calcium (8%), potassium (7%), magnesium (18%), manganese (7%) and phosphorus (5.5%). Magnesium and calcium take part in the bone and teeth mineralization, and rhythmic function heart. Manganese is used by the body as a co-factor for the antioxidant enzyme, superoxide dismutase. Kangkong greens are abundant sources of health benefiting nutrients which when consumed on reguar basis found to prevent osteoporosis, iron deficiency anemia, and vitamin-A deficiency, and believed to protect from cardiovascular diseases, and colon and prostate cancers. Kangkong is ready for harvesting about 45 days after seedling. Pick top shoots; leave about 2 inches off the lower stem to promote new growth for later harvest. Harvest before blooming for best flavor. In the markets, water spinach is sold in bundles of various sizes and weights. Look for the deep green, large leaf types since they are more flavorful than the small leaf variety. Avoid wilted, yellowish leaves. Also avoid damaged, insect afflicted greens. Water spinach leaves damaged early if not stored in the cool surroundings. Keep them wrapped in wet towels, and place inside the refrigerator as in other greens like spinach. As in watercress, this leafy green too grows in the aquatic environments. Wash in clean running water and then soaked in salt water for about half an hour in order to rid off parasite eggs and worms that thrive well under aquatic conditions. Mop dry using a soft cloth or paper towel. Chop using a paring knife. Trim away tough stems. Young tender shoots may be eaten raw in salads. Larger leaves should be cooked before consumption. Kangkong greens have a very mild and subtle sweet taste and slightly mucilaginous texture. Steam cook or braising brings out their unique flavors and contrast texture between crunchy stem and succulent, moist leaves. Sauté with butter and garlic, and toss with little vinegar, and finish with sprinkling toasted sesame seeds. Boiled greens may also be served creamed and cheese prinkled. Fresh, tender shoots of kangkung used in green salads. Young stems and leaves are boiled, steamed or sauteed in oil, and used in various dishes such as stews and curries. 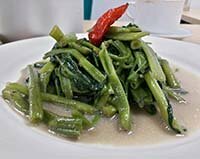 Tumis kangkung is an Indonesian stir-fried water-spinach with chilies and shrimp paste. Finely chopped young stems and leaves can be sautéed in oil and garlic used as a filling for momos (dim sum). Kangkong is also a good substitute for other leafy greens such as spinach, chard, basella, sorrel etc, in many recipes. Being an aquatic plant, kangkong greens may harbor many water-borne worms which may cause infections like flukes (F. buski). The larval stages of these trematodes encyst (called as metacercariae) on aquatic plants such as water-spinach, water chestnut, water caltrop, lotus root, and other edible plants. Raw, uncleaned greens when consumed may cause symptoms like stomach pain, diarrhea, fever, allergic reactions to larvae, and in cases of heavy infestation, intestinal obstruction. Buy water-spinach from the recognized farms that use clean water for irrigation. Avoid if the greens sourced from stagnant and polluted water. (Medical disclaimer). <<-Back to Vegetables from Kangkong (water spinach). Visit here for an impressive list of vegetables with complete illustrations of their nutrition facts and health benefits.